Go for it, you can never have enough spatulatas. But, I know what you mean with the KitchenAid ones. I received one for a wedding present and love it! 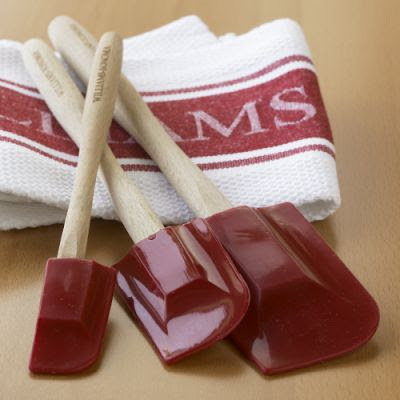 I'm addicted to Williams Sonoma spatulas ! I love to collect all colors !!!!! No, you can't ever have too many spatulas! Especially not cute personalized ones! I really can't go in to WS without experiencing intense spatula lust. I want them in all of the seasonal colors. I don't know if you can ever have too many spatulas, I wish I had more than the two I have. Go for it! You really can't have too many spatulas...I got all four of mine at a Williams-Sonoma outlet (best place ever) but I think I could use a nice red one too. I love that you could take cooking classes in college...I always envied my BYU friends for this! Too cute!! I LOVE those spatulas. You need them. You can never have too many and you definitely need them with your name on them! I'm a huge fan of spatulas ... especially the modern silicon ones that you can use in high-temperature dishes. However, I prefer the single-piece models. I've had too many spatulas decide that the love affair between the head and the handle had come to an end. I love spatulas of all kinds and colors. I love the red though! I agree that you can never have too many spatulas. And personalized ones sound so cool! I didn't know you could get them personalized. How cool is that? There is no such thing as too many spatulas! i'm a sucker for anything personalized, so i say go for it...besides, I love the red color! I love this type of thing. 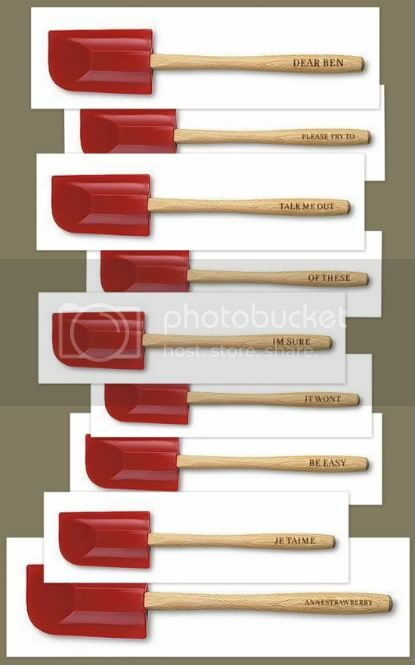 Personalized spatulas? I would have ordered them already. You have got will power! See, I'm a toss-up for KitchenAid and Williams Sonoma. I love the KitchenAid flat spatula (regular size...) but can't stand their curved spatula. I love William's Sonoma's curved... but their flat is kina flimsy. What can I say... when I find spatulas that come in PINK... I'm already way too picky... I might as well finish the job of uber pickiness, no?